Two complementary effects integrated seamlessly. Fantastic vintage trem and vibrato sounds. Innovative. Tremolo and vibrato may not be the top two effects on everybody's shopping list but they can sound great together, and here's a pedal that gives you that combination, taking its cue, says Amptweaker, from the synchronised tremolo and vibrato circuits common in some vintage 60s amplifiers. "The SwirlPool delivers a lovely deep throbby tremolo that gets an extra dimension when you add in some vibrato"
In the default mode, tremolo is the basic effect. One footswitch operates bypass, while the other switches between two tremolos: Speed 1 and Speed 2. While tremolo depth is the same for both, set with a common knob, each tremolo has a knob for speed and another to dial in the amount of vibrato if you want to add some to the signal. An alternative mode lets you disable the tremolo for Speed 2, so the footswitch effectively selects either tremolo or pure vibrato. Two effect loops are provided for adding more pedals, and five small two-way switches tweak the overall sound. This gives you different ramp times from between speeds, a swimmier vibrato, a jerkier tremolo and subtle variations on how the tremolo and vibrato synchronise. 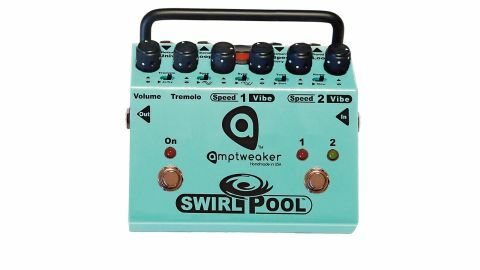 The SwirlPool delivers a lovely deep throbby tremolo that gets an extra dimension when you add in some vibrato, and the vibrato by itself is very musical: no seasick pitch shifts here. Overall, besides vintage trem, there are some very tasty sounds to be discovered here, that are reminiscent of the 'harmonic vibrato' found in some 'brownface' Fender amps and Uni-Vibe and rotary speaker sounds. It's an inspired deviation from standard tremolo pedals.